Here’s a picture I thought you might be interested in. 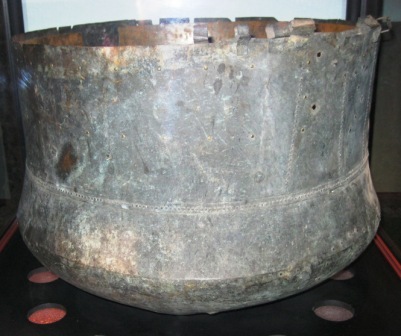 It’s the Bewcastle Cauldron, and it’s in Tullie House Museum in Carlisle. I wish I’d had a ruler on me for scale when I took the picture – it’s enormous! – certainly big enough to hide a couple of six-year-olds. Bewcastle is a tiny place right in the far north-east of Cumbria, close to the border with Northumberland and Scotland. It’s surrounded by prehistoric monuments; there are a great many stone cairns dating to the period when the Stone Age ended and the Bronze Age began, about 4,500 years ago. There are also the archaeological remains of these people’s homes: Bronze Age round huts. Bewcastle is probably more famous for its Roman fort, built at about the same time as Hadrian’s Wall. There’s no very obvious reason for it to be there – it’s in a dip in the landscape, is surrounded by bogs and it isn’t visible to other major Roman forts. The site is very rich in religious remains with six inscriptions and a couple of silver plaques dedicated to the British god Cocidius, here conflated with the Roman god of war, Mars. The 7th-century Ravenna Cosmography, which lists every place in the Roman Empire, describes a ‘Fanum Cocidius’ (Cocidius‘s temple) between Maia (Bowness-on-Solway) and Brovacum (Brougham), and it’s not at all unreasonable to think that Bewcastle, where we have all these Cocidius inscriptions, is that very place. The Bewcastle Cauldron was found in 1907 at Black Moss, just outside the village, submerged in the bog under layers of peat. It’s made from very thin sheets of bronze, riveted together, and would have been a very valuable object. Doubtless it belonged to a chief of some sort, for use at feasts, when it would have been filled to the brim with beer or broth to demonstrate the leader’s wealth, power and largesse. It’s been repaired many times with little patches carefully riveted onto the original material; it seems that although it pre-dates the arrival of the Romans, it could still have been in use when they were here and may even have been abandoned after they left. The funny thing is that despite all the evidence of ancient human occupation in this remote part of the world, there’s no suggestion there was a population actually living here in the period immediately preceding the arrival of the Romans, when the cauldron was made. Of course it may be that one day we’ll find this evidence, but at the moment we have to conclude that Bewcastle, Fanum Cocidius, was solely a place of pilgrimage rather than habitation at this time. And someone, somewhere, thought this site was important enough to carry this tremendously heavy, large object to the moss, dig a giant hole, and bury it. We know that our Iron Age ancestors deposited valuable things – and sometimes bodies – in boggy ground and there are certainly hints in myth that we believed these areas that weren’t quite water and weren’t quite earth were just the places to send messages to the gods. I wonder what message was delivered with the Bewcastle Cauldron? A Place to Believe in: Locating Medieval Landscapes ed. Clare A Lees and Gillian R Overing (2006). See pp 29-66, written by Fred Orton. This entry was posted in Folklore of Cumbria, Folklore: Magical, History of Cumbria, History: Bronze Age, History: Iron Age, History: Pre-Roman gods and goddesses, History: Roman, History: Unburied treasure and tagged bewcastle, bewcastle cauldron, cocidius, cumbrian history. Bookmark the permalink. Hello there! Glad you’re enjoying it. The older the story, the more likely we all share it, don’t you think? Glad you liked it! I remember Lindow Man well – I lived very nearby when he was discovered. We called him Lindow Pete (=’peat’)! The cauldron is of a similar date to Lindow Man. Hello Tim! Glad you enjoyed it – there are quite a few interesting older objects at Tullie House. There’s a fab collection of ‘Celtic’ heads and lots of local Roman stuff, too. Does TH still have that Reivers audiovisual display with the bishop’s curse, etc? Saw it 20 years ago and greatly enjoyed it. If the cauldron was also displayed back then I must have somehow walked past it without noticing. Cue lots of comments about the floods, etc, being a result of said curse!